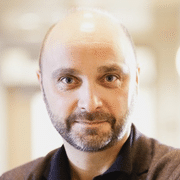 Sylvain Baillet is a physicist with research interests in methodological developments for functional and structural brain imaging and their application to clinical and cognitive neuroscience. Although his primary expertise is with MEG (magnetoencephalography) imaging, he also contributed new techniques for MRI image segmentation and inter-subject registration. He has also initiated new image analysis techniques for the early prediction of infarct growth in stroke patients, using diffusion-weighted MR sequences. He has also great interest in disseminating his research through academic software: he is a founding developer of the Brainstorm open-source software project (http://neuroimage.usc.edu/brainstorm) for MEG and EEG imaging with MRI integration.